More than 1,200 children-authored books have made their way into the proud hands of young authors under the nurturing direction of Tracey Frank Pringle. 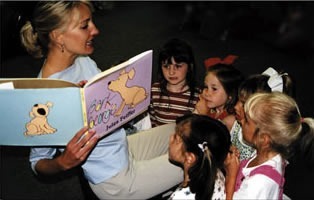 Since 1998, Tracey has been the owner and director of Club Literacy in Newport Beach and Dana Point. Club Literacy is an educational center dedicated to the development of lifelong readers. Ms. Pringle founded Club Literacy under the principle that “Lifelong Readers are Lifelong Achievers.” Specializing in early literacy, the center welcomes students from all walks of life and all learning levels. Over the past decade, Club Literacy has provided hundreds of “mini scholarships” by donating reading classes to multiple local charitable organizations. Tracey is a credentialed teacher in both California and North Carolina. She earned Bachelor of Arts degrees in both Speech Communication and Early Education. Prior to opening Club Literacy, she successfully taught eight years in public school, grades Kindergarten through Fourth. Tracey is a literacy advocate, traveling internationally to research effective educational techniques. She is also a trained coach for the Orange County Reading Success Network. Tracey strives to create a nurturing environment in which all children are encouraged and guided to reach their creative and academic potential. In 2010, Tracey was awarded the Woman Sage Award of Orange County, for her work in Child Development. When she is not working, her greatest joy is spending time with her husband and two children. Her daughter Charlie and son Mercer, ages 5 and 3, are absolutely the highlight of her life. Her proudest moments are seeing her own children develop a strong love of literature. Her daughter Charlie has successfully mastered writing her ABC’s and is beginning to read! Mercer, while simultaneously exhausting and thrilling his mother sweetly requests, “More books please!” each evening at bedtime.